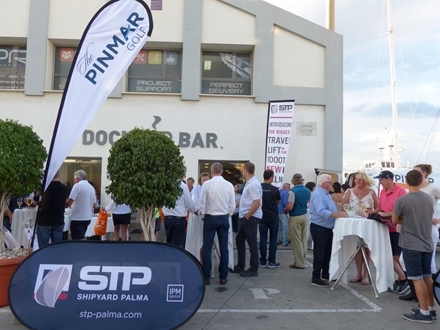 Last week the long-awaited The Pinmar Golf tournament was held in which STP Shipyard Palma and Varadero Valencia were sponsors of one of the most important phases of the event, the Captain’s Briefing. The tournament began with a sunny day in which the marshalls went to the STP Shipyard Palma to manage the registration and collection of documentation and the goodies that Pinmar and STP had prepared for the players. In this briefing, the four members of the STP golf team participated, who once again enjoyed the tournament from beginning to end. It should be noted that the setting of this presentation attracted the attention of all the players, since the shipyard had a recently acquired the new travelift of 1,000 tn. There they could see it in working action. The second day of Captain’s Briefing, also sponsored by STP Shipyard Palma and Varadero Valencia, was held in Son Gual, coinciding with the first day of play on the golf course. Despite the forecast of rain for the whole weekend, the weather respected the hours of play and the tournament was finished without major setbacks. At the gala dinner, in which the prizes were awarded, the STP Shipyard Palma golf team once again took centre stage as it was the CEO of STP and Varadero Valencia, José María Campuzano who delivered one of the most original prizes of the night. A replica of a Noray hand carved in wood by a craftsman carpenter, which went to the team of David Store Navigational Management LTD, for the second consecutive year for the “Best non Yacht Gross”. The magnitude of this event is bigger every year thanks to the great work done by the Pinmar team. The Pinmar Golf has the recognition of golf enthusiasts of the international nautical sector, and proof of this is that it receives annually a large number of captains, brokers, yacht owners, industrialists and companies related to the sector, becoming an excellent opportunity for personal relationships and networking for all.